Although this Site may provide information concerning legal issues, such information is not intended to constitute or be a substitute for legal advice from qualified counsel. You agree that HUSSEINSHOUKRY LAW FIRM is not engaged in rendering legal services or advice by providing the information and materials on this Site, and that your use of the Site does not create any attorney-client relationship between you and HUSSEIN SHOUKRY LAW FIRM. HUSSEIN SHOUKRY LAW FIRM assumes no responsibility for any consequence relating directly or indirectly to any action or inaction you take based on the information or material on this Site. While HUSSEIN SHOUKRY LAW FIRM takes reasonable measures to keep the information on this Site accurate, complete and up-to-date, HUSSEIN SHOUKRY LAW FIRM will not be responsible for any damage or loss related to the inaccuracy, incompleteness or lack of timeliness of the information. All materials contained on this Site, and all intellectual property rights thereto, including copyrights, trademarks, service marks, trade names and trade dress, are owned by HUSSEIN SHOUKRY LAW FIRM or its affiliates. You agree not to copy, reproduce, republish, transmit, modify or distribute any of the materials contained on the Site, except for your personal, noncommercial use, absent the prior written approval of HUSSEIN SHOUKRY LAW FIRM. may include links to other Internet sites that are beyond the control of HUSSEIN SHOUKRY LAW FIRM. www.hshoukrylaw.com is not responsible for the content of any such sites, makes no representations regarding any such sites, and does not necessarily endorse or approve of the information, material, products or services contained on or accessible through any such sites. You acknowledge and agree that your linking to other sites, your use of such sites, and your use of any information, material, products and services offered by such sites, are solely at your own risk. The materials provided on this site are provided “as is” and without warranty of any kind, express or implied. HUSSEIN SHOUKRY LAW FIRM disclaims all express and implied warranties with regard to the information and materials contained on this site, including without limitation implied warranties of merchantability, fitness for a particular purpose, and non-infringement. In no event shall HUSSEIN SHOUKRY LAW FIRM, or its partners or affiliates, or contributors to this Site, be liable for any loss or injury, or any damages, whether direct, special, indirect, punitive, incidental, exemplary, consequential, or otherwise, whether based on breach of contract, tort (including negligence), product liability or otherwise, resulting from your access or use of this Site. 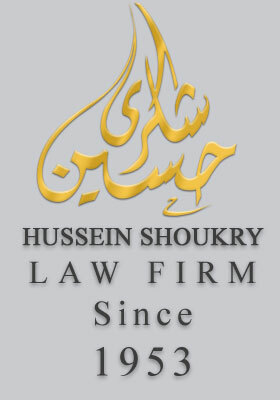 You hereby waive any and all such claims against HUSSEIN SHOUKRY LAW FIRM, its partners, affiliates, and contributors. You agree that the limitations set forth above are fundamental elements of this agreement, and that the site and its materials would not be provided to you absent such limitations. HUSSEIN SHOUKRY LAW FIRM failure to insist upon strict enforcement of any provision of this agreement shall not be construed as a waiver of any provision or right. 9th floor, Adham Commercial, Medina Road P.O.Box 667, Jeddah 21421, Saudi Arabia.